A wide range of applications are based on microfluidic devices made of silicone rubbers such as polydimethylsiloxane (PDMS), including materials synthesis, separation and sorting, diagnostics and bioanalysis. The popularity of PDMS in academic laboratories is due to the simplicity of the fabrication and well-characterised properties of PDMS. However, PDMS is not compatible with strong organic solvents, which quickly swell silicone-based materials. To this end, microfluidic channels possessing chemical and solvent compatibility are desirable. A research team from the Singapore University of Technology and Design (SUTD), led by Assistant Professor Michinao Hashimoto, developed a simple method to fabricate microchannels using fluoropolymers—a general class of polymers including Teflon that are highly inert against the exposure to chemicals and solvents. The research group applied xurography, a method of digital fabrication to cut films with a motion-controlled razor blade to create stencils. Via this technique, they cut films of fluoropolymers and heat-pressed them to form microchannels. It takes less than one hour to make microchannels from designing to assembling using this method. The research team has identified proper conditions of heat pressing (i.e. temperature, time and pressure) for two common fluoropolymers: polytetrafluoroethylene (PTFE) and fluorinated ethylene propylene (FEP). 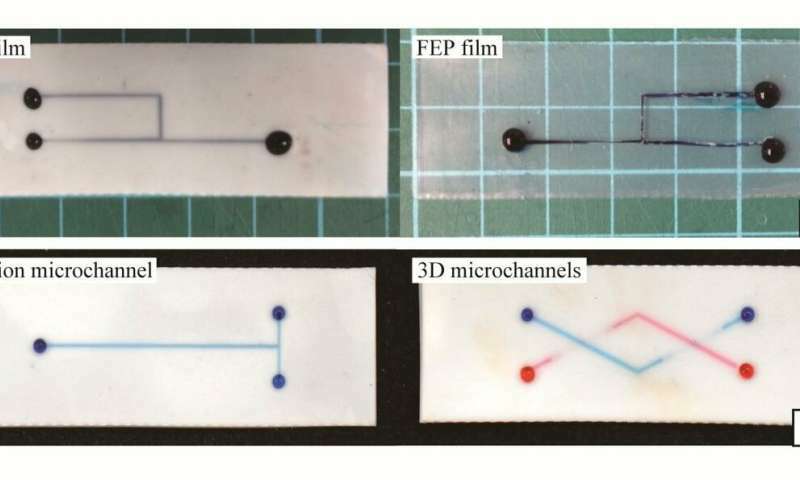 Furthermore, the team confirmed the resistance of the fluoropolymer microfluidic channels to a set of organic solvents that would be incompatible with typical devices fabricated in PDMS. Principal investigator Dr. Hashimoto said, "This work is the first demonstration to rapidly fabricate microfluidic channels using fluoropolymers. Microchannels consisting of fluoropolymers can be useful in performing organic synthesis of materials and drugs as well as regulating adhesion of biological molecules, cells and bacteria. This method is extremely simple, and we believe it can be performed by literally any researcher—including non-engineers—for various applications that require the inert and non-reactive properties of the channels."